On the 23rd of January, the EOS Secretariat participated in a public hearing at the European Parliament about Harmonisation as a principle for Single Market legislation. Two panels discussed the actual benefits of the harmonisation of national rules and the possible future framework for harmonisation in the EU Single Market. Business and consumer representatives together with policy making representatives from the EU Council and the European Commission delved into the issues of reducing regulatory obstacles, bringing transparency for consumers, attracting investments and competing at global level through harmonisation. EU harmonisation is key to ensure consistency of legal framework, so that the same rules and standards apply to businesses that operate in more than one Member State. This also reduces regulatory burdens and costs of compliance for businesses operating cross-border. Furthermore, harmonisation brings transparency and trust for consumers through common protection rules. Eurochambres, the Association of European Chambers of Commerce and Industry, argued that in a survey of 2015, 84% of entrepreneurs thought that the European single market was not integrated enough. The Juncker Commission (2014-2019) strove to improve the situation but at the end of 2018 in another survey 70% of entrepreneurs still thought that the European single market was not integrated enough. A solution envisaged might consist in creating a single online portal where businesses could access information and learn how to operate in foreign countries. It was emphasized that three main EU institutions – the Council, Parliament and European Commission are not working properly in speeding up completion of the Single Market. The Commission has presented 67 proposals directly relevant for the proper functioning of the Single Market, 44 of which remain to be agreed. In July 2018, sixteen Member States asked for a new commitment to do a comprehensive stock-take on barriers and inefficiencies in the internal market by December. This group has not been joined by France and Germany in spite of the fact that several studies have shown the widespread economic benefits that full completion of the single market would bring, even to larger EU countries. These studies also stress that SMEs would mostly benefit from a fully integrated European market. Eurochambres also called for a careful balance of traders and consumers right and reject new protectionist tendencies. Simplification of rules, reduction of regulatory and administrative burden and consistent application of both ex-ante and ex-post assessments of policy choices should remain centre-stage in order to ensure that the EU Single Market is the best place to do business and work. Single Market legislation should consistently reflect the market integration ambition through reduction of barriers and be future-proof: it should allow for innovation, flexibility for business to respond to fast-changing environment, enable new business models and be technology-neutral. Harmonization measures need to result in a convergence of enforcement: oftentimes the EU-set rules are satisfactory but lack of compliance of Member States undermines the single market efforts. BEUC, the European Consumers Organization, argued that EU harmonisation has brought solid benefits to the consumers: Europe is the safest place in the world when it comes to food standards, chemicals and eco-design, just to mention a few. The best contribution of the EU to the consumer protection framework in the member countries happens where the best practices of some member states are taken over by others: upwards harmonisation is the way to go. Not all harmonisation is good: if the EU legislates with lower standards than the ones already applied in some countries then some consumers lose out causing resentment. The ideal situation is when full harmonization takes place at the highest level of consumer protection: as a result we have a strong single market with strong consumer protection The principle of minimum harmonization (by which a EU piece of law sets a threshold which national legislation must meet and national law may exceed the terms of the legislation if desired) is to be adopted if the level of consumer protection in the Member States is diverse. BEUC also emphasized that the harmonization of laws needs to be accompanied by the harmonization of enforcement. The European Commission emphasized that over the last 25 years, the single market has made Europe one of the most attractive places to live and to do business. Its four indivisible freedoms – the free movement of people, goods, services and capital – have helped improve our citizens' prosperity and strengthen the EU's competitiveness. To exploit its full potential in the digital era and ensure sustainable growth of our economy, the single market needs to function properly and constantly evolve in a rapidly changing world. 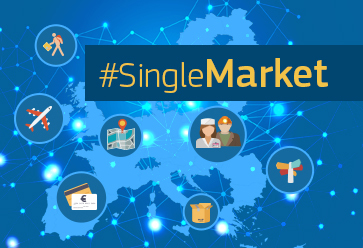 To underscore the importance of the single market for the Commission, it was emphasized that the next EU budget (2021-2027) will contain a lot of resources for the single market. Standardisation is needed to remove the technical barriers to trade: European standards that remove potential conflicts between different national standards facilitate trade and contributed to the integration of the Single Market and build trust. A fast-changing industrial landscape requires adequate standardization responses. The Commission underlined the positive “public private partnership” between the Commission and the standardization organization, where the private sector is also represented. There is excellent cooperation indeed between the two. In response to a question, it was emphasized that SMEs who don’t have the personnel to follow standardization shall make sure that the Brussels-based organization of which they are members are adequately represented in standardization processes.